1. MUSCLE TEARS – Gastrocnemius – The gastrocnemius makes up a large portion of the calf muscle. The muscle below it called the soleus completes the large muscle belly in the back of the lower leg. The muscle connects the upper leg bone just behind the knee to the heel bone at the bottom of the foot. PROGNOSIS:Prognosis is excellent in almost all cases. Occasionally bone may develop within the muscle which may affect the long-term prognosis. CONDITION: An injury to the muscle that has occurred most commonly following an athletic activity. The muscle has stretched to its elastic limit but has not torn. MYOSITIS is an inflammation of the muscle usually caused by overuse. Shin splints are a form of this where the muscle starts pulling away from the bone causing inflammation to develop at the muscle bone junction. 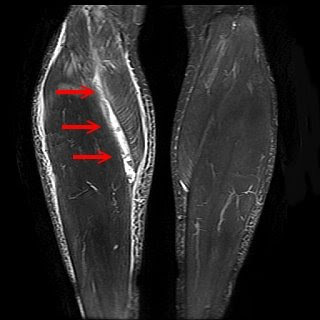 MRI of gastrocnemius muscle where the area indicated by the red arrows is a tear in the muscle tissue which shows as bright white within the normal dark muscle tissue. Contusion of the leg with swelling and ecchymosis as a result of a tear in the muscle belly of the calf.